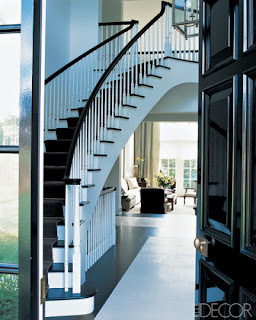 When walking into the front door of your home, the first space people see is the foyer. It is the first impression people get for your design style. As my mom would eloquently put it- It is the appetizer before the main course! Many people (including myself), get so caught up with decorating the main living spaces in the home, that the first impression space is forgotten. I have been dreaming about- and will achieve- a finished, and (hopefully) well put together foyer. It is one of my next projects! This year, I have a new love for wallpaper! 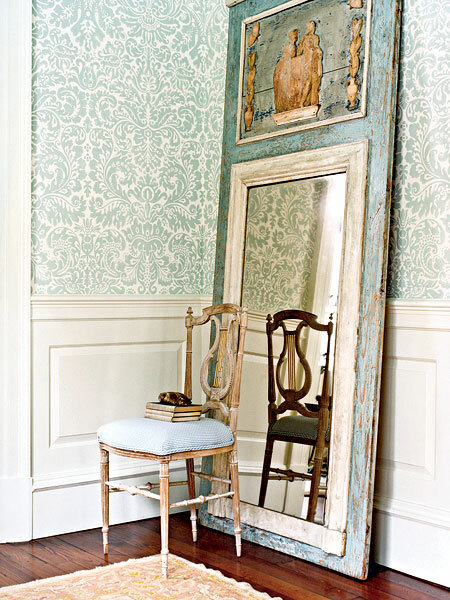 I adore a large damask print that blends modern with traditional. 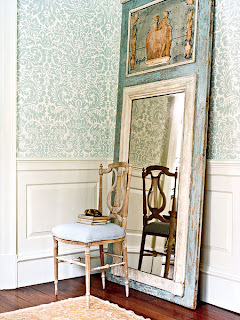 I have learned from watching HGTV’s Dear Genevieve, that traditional prints like damask, transform into a more modern look when the print is blown up in size and repeated. And we all know that I love to blend modern with traditional! Here is a peek into some amazing foyers that have helped to inspire me. Which is your favorite? 1. 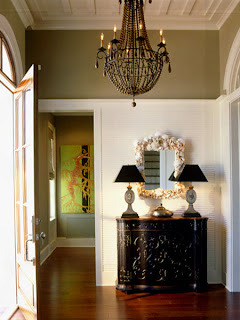 This beautiful foyer has the large damask print that I adore! From Southern Accents. Photo by Roger Davies. 2. I love this space! It seamlessly blends modern with traditional. The chic, urban style of the block wallpaper juxtaposes beautifully with the traditional columns and settee. From Cottage Living. Photo taken by Robbie Caponetto. 3. 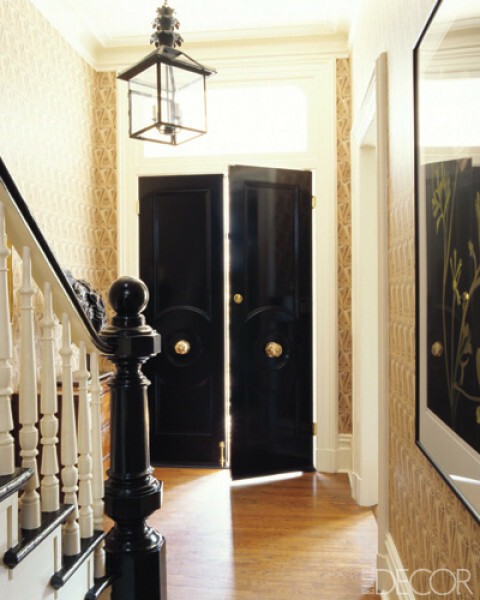 I love the traditional wallpaper and lantern fixture, paired with a bold, dark color on the doors, stairs and newel post. From Elle Decor. Photo taken by Simon Upton. Designed by Courtnay Daniels Haden. 4. A very chic entrance! Also from Elle Decor. Photo taken by Simon Upton. Designed by Vicente Wolf. 5. What a chandelier! The style in the fixture is very traditional, but the darkness makes it so devinely modern! I love the detail in the mirror too. From Coastal Living. Photo taken by Jean Allsop. 6. Last but certainly not least, my love of neutral had to make an appearance! I enjoy it’s simple elegance. From Southern Accents. Photo taken by Tria Giovan. Designed by Mary Evelyn McKee. When looking though a decorating magazine or watching an HGTV show, there is one style of kitchen that always gets my attention- an all white space! There’s just something about it that makes my heart go pitter patter! I love how clean and modern, or traditional and cozy it can become. The choice in finishes, appliance colors and style of cabinets can help tell your design story. For me, I like to juxtapose different styles together! I love the sleek look of stainless stell appliances with modern style cabinet handles. 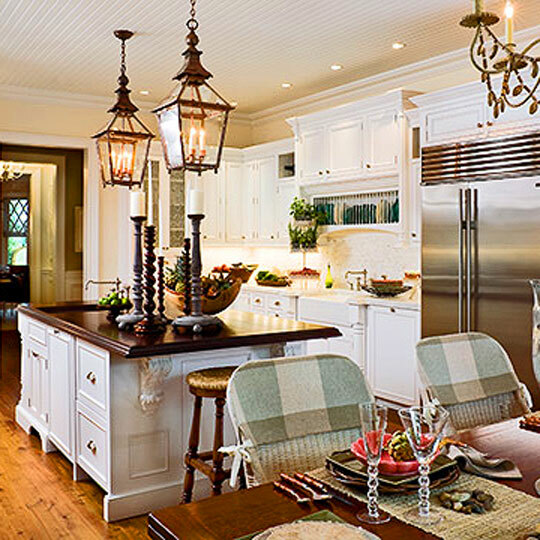 To add a touch of traditional, I love the look of schoolhouse pendant lights over a huge antique, furniture style island. I love the classic look of white subway tile as a backsplash with white quartz or marble counters. 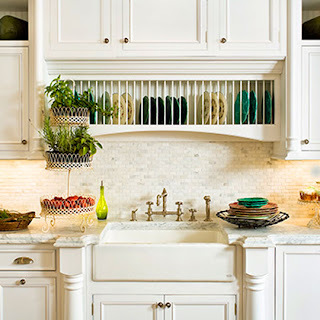 To make the kitchen appear as if it’s always been there, I love huge farmhouse sinks with a gooseneck style faucet. To contrast all of the white, I love pale blue-gray walls with beautiful dark hardwood floors. Now that the finishes have been chosen, it’s on to the details that make a space feel like your own. 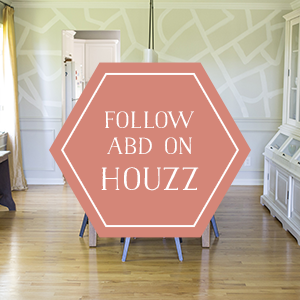 Choosing the accessories, drapes and seating will put your design stamp on the kitchen. 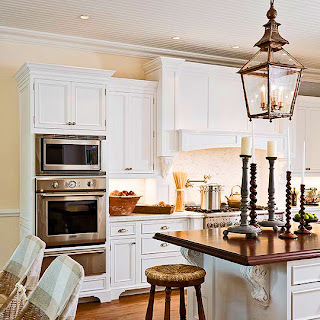 Below are pictures of beautiful kitchens where I can draw inspiration. 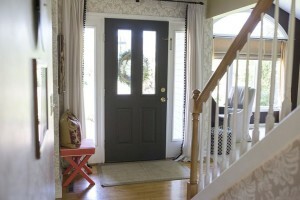 The first three photos are from Traditional Home and the designer is Denyse Rinfret. The last photo is from Southern Living. These marvelous kitchens are my great inspirations. There are times when a room needs a little pizazz. It can be the paint color on the walls, the fabric choice for the drapes, or the had to have piece of furniture that takes your space to the next level. Whatever makes the space pop can be the talk of the town when people come to visit. For me, I always go back to this color palette- my favorite colors that when grouped together- are unstoppable. I adore deep browns paired with blue grays, dark creams and whites. My living room is painted Mink by Benjamin Moore. It is an amazingly dark brown color, that almost looks black. I was a little afraid when I saw the paint chip, knowing that all of my walls would be that color! Luckily, we get a ton of natural light in the room, that when paired with a cream carpet, it works. So far, we have a huge starburst mirror, in a rust bronze that dominates the main wall. We brought in creamy gold drapes and have started to use white and blue gray accent pillows. We have two antique furniture pieces in the space, paired with table lamps with very modern drum shades. For the most part, the space is still unfurnished, because we are still trying to find the right pizazz to add to the room. I was thinking of a deep, brown velvet sofa with some occasional chairs in a fabric that compliments the four fav colors! I also thought of a sleek, clear acrylic table in front of the couch, to blend modern with traditional. I am wondering what you think! What else could fit in the space to make a statement? Here are some of my design inspirations taken from Elle Decor’s look book and Sunset. I love this space! Elegant and comfortable. This is from Elle Decor. Photo taken by Simon Upton. Designed by Elizabeth Martin. Again, the beautiful dark brown sofas! Here, the wall color is much lighter, and the space also works beautifully. Also feautured in Elle Decor. Photo taken by Roger Davies. Designed by Jamie Creel and Marco Scarani. I had to include this pic because of the amazing cowhide rug! Also from Elle Decor. Photo taken by William Waldron. Homeowner is Kelly Klein. There is the coffee table I love! From Sunset. Photo taken by Thomas J Story. Some may believe lack of color means lack of style. 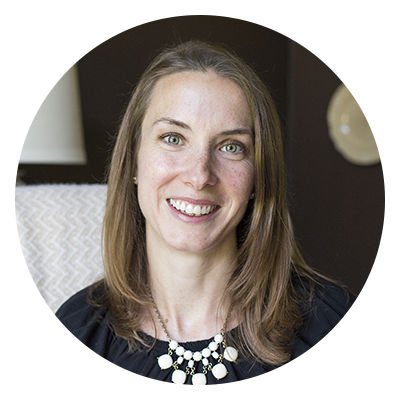 I saw a great episode of Candice Olson’s Candice Tells All, where she proves them wrong! On this show, she redesigns a master bedroom using soft, neutral hues. She eloquently explains that neutral doesn’t have to mean boring- the layering and texture that you add to the design are crucial in making it look polished and interesting. Candice stayed with warms neutrals, soothing grays and ivory hues, but paired them using different textures and fabrics. She found several different fabrics and prints to layer as pillows, throws and key furniture pieces. She used a beautiful statement piece on the wall above the bed. It was a large, circular feathered piece in an ivory color. The color itself was so simple, but the texture in the feathers gave such depth to the wall. And to give the room more character, she used some wood furniture pieces, (nightstands, accent tables) to give the room a masculine touch. This room stood out as a restful retreat, not a boring space! I hope to attach some pictures of the room soon. 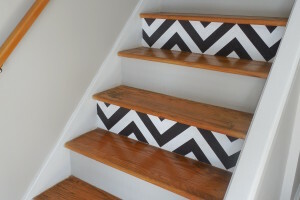 When thinking of ways to make your home reflect your stlye, inspiration can come in many forms. If you love the outdoors and nature, simply going outside for a walk can become a great way to begin! There are so many beautiful colors outside during the seasons, from which to draw inspiration. My favorite season for design is fall. I love the colors of the leaves when they turn bright orange and golden brown. The rustic look of the brances is a great textural inspiration. I like to think of pairing a rustic dining table with more modern chairs, as a way to mix the old and new. Another great nature walk is to the beach. The colors of the water and sand can be so soothing and relaxing. Great colors to have in the restful places in your home. Inspiration can also come from the people in your life. When family pictures surround you, your home instantly becomes a relaxing story of your life and the people in it. My family inspires me, because they challenge me to be creative in the ways we organize our life and how we can all have a design voice. My mom has always been a great inspiration to me, because she has a great way of combining different styles and making them work. She has always said and this is so true, that “if you find something that you love, you can make it work in the space.” It goes back to pairing your favorite things with what inspires you! Enjoy the nature walks and the people in your life! When I say that your decor tastes will change– I say that from personal experience. When I was younger, I loved contemporary design. I remember driving by a very modern house, and thinking it was my dream home! When I went away to college, I loved everything that was cheetah or leopard print! I had leopard print curtains, pillows- you name it! When I got married to my wonderful husband, I introduced him to my love of shabby chic! Everything in our apartment was yellow, cream or pink! The couches were slipcovered white and there were floral prints on the walls. After realizing it might be too much for us, the style in our home turned more primitive, early Americana. We shopped at small shops and found more masculine colors and early American folk style pieces. And as we get older and our taste evolves, we are now at the current style, which is a return to modern. We like a more simple, contemporary look, with a blend of traditional elements. The mix of old and new, traditional and modern is the perfect match for us! Over time, your style will evolve and new pieces will come into your home and mix with the wonderful things you already have. It’s an everchanging process, and we’re along for the ride!